Destroy your foes for festive cheer. 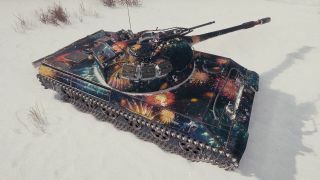 World of Tanks is getting all festive, or at least as festive as a game about huge tanks relentlessly fighting can be. Holiday Ops 2019 starts soon and will begin with the gift of a free tank, the MKA, a tier 3 premium tank. Cheers, Santa. For more rewards, you’ll need to do more than just be well-behaved. You’ll need to crush your enemies in holiday missions. Death, destruction and loot boxes—it’s a very traditional Christmas in World of Tanks. Holiday missions will task you blowing up tanks, winning battles, doing a certain amount of damage and other challenges, rewarding you with loot boxes. Each of them will contain consumables, credits and holiday decorations. What does a tank need holiday decorations for, you might be wondering. Well, it’s not for them—though you can decorate your tank with festive skins—it’s for their crews, who can enjoy a nicely decorated yard to hang out in when they’re not dying horrifically inside a metal box. There are four themed collections, each with their own bonuses. And you can smash ones you don’t like for shards, which you can then turn into new decorations by using the awkwardly named Large Holidron Decorider 2.0. If you’re trying to finish a collection, you can tweak the machine’s options, letting you pick the decoration type, level and collection, so you’ll have a better chance getting the one you need. Apply the decorations to your garage yard and you’ll increase the area’s festive atmosphere, netting you more rewards, including discounts up to 100%, consumables, experience and four new female tank crew members that can be trained in any specialisation and attached to tanks from any nation. Each has the Brothers in Arms perk and enough experience for an additional one. If you missed out on last year’s Holiday Ops or just didn’t complete your collection, you’ll have another chance this year, as every reward is available by using shards. Holiday Ops 2019 starts on December 13 and ends on January 14.